Why use our Heavy Duty Wrist Wraps? You certainly can. Our wrist wraps should be hand washed in cold water only, using a gentle detergent. You can dry flat or hang then up to dry. Our wrist wraps have a degree of protection but are not warranted to protect the user from injury. High elasticity Polyester material to allow for either a loose or snugger fit without cutting off circulation and provide good support, are more comfortable & allows wrist flexibility. 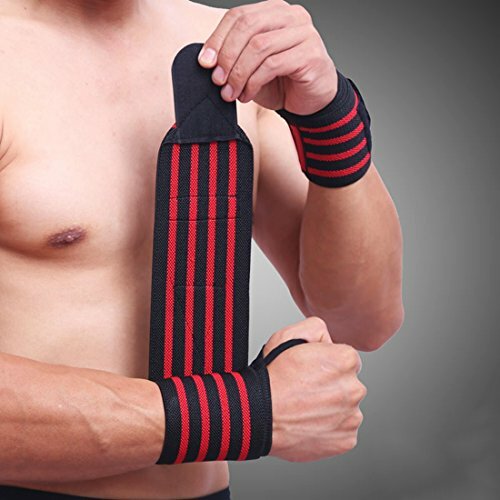 STABILIZE YOUR WRISTS & LIFT MORE WEIGH: These high performance straps provide wrist support & stability for weightlifters, Crossfit Training, Weight Lifting, Powerlifting, Pushups, (all types) Planks, burpees & strength training. This standard Wrist Wrap model is sold in pairs. It includes a convenient thumb loop and hook-and-loop closure for a secure fit, easy adjustments, and quick removal. BEST HEAVY DUTY & top grade wraps: Support and strengthen your wrist to prevent sudden twists & Enjoy bigger gains and sustained workout routines at the gym. GUARANTEE: We're confident you'll absolutely love our wrist wraps! If somehow you aren't 100% satisfied, just contact us!